A dear friend of mine Gaynor recently did me an enormous favour. She didn't have to but she went out of her way to assist me and I was so grateful for it. I have that thing where I always have to bring something to your house if I drop by. If we meet up, I'll try (but not always succeed) in making you something and if you have extended a kindness, I want to give you something in return. It's the Chinese genes (although I'm not saying that this is only restricted to Chinese people) but Chinese kids have definitely been taught never to turn up at someone's house empty handed - oh the horror and the gossip! A couple of months ago, Gaynor made a comment on my lamb shank curry recipe that said that she missed eating lamb. She now lives in Singapore where lamb "costs a bomb" so I decided that I wanted to send her a thank you present by sending her meat. "Why don't you send flowers?" Mr NQN asked and I could see his look said, "like a NORMAL person does..." but I had lamb on the brain. He remarked that at least she hadn't mentioned fish and I concurred. You don't necessarily want fish being delivered to an office environment. Not that meat is that much better but it had a longer life as it was cryovacced whereas a whole fish generally isn't. 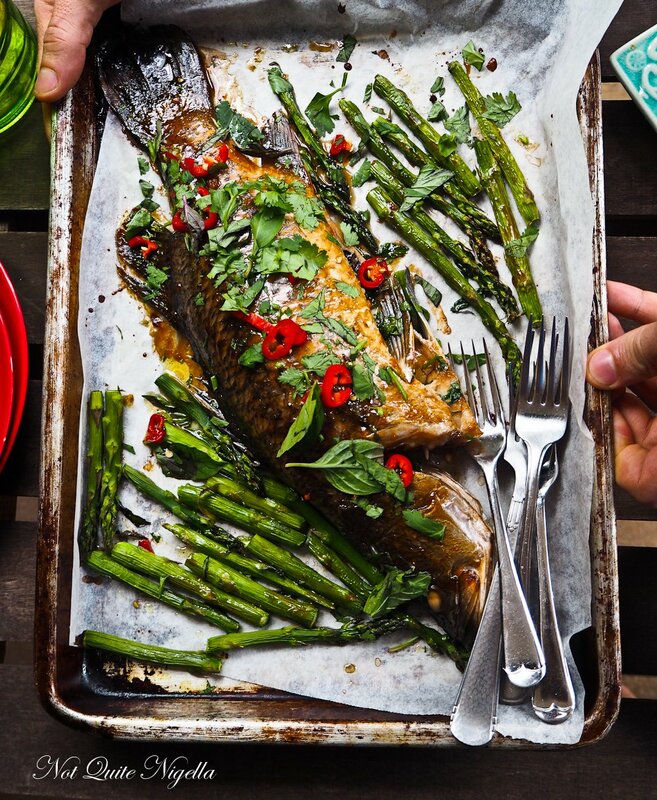 If I could send anyone a fresh barramundi I would for this recipe. You see this is an absolutely accidental recipe. I had intended to just buy pippies for dinner but then the barramundi caught my eye a the fish market. I knew that I could steam it but to be honest the idea of pulling out the steamer from the depths of my cupboard was just too much for the end of an exhausting weekend. So I switched the oven on, grabbed some Thai basil and coriander and just made a sauce out of oil, oyster, fish and sweet chilli sauce not expecting much at all. But I was wrong, I got the first hint that it might be good when it came out of the oven. The skin glistened appealingly and I grabbed the camera. I snapped a few pictures and then we ate it. The sauces and oil had combined to create a deliciously flavoursome seasoning for the fish and the fresh herbs stuffed in the cavity added freshness and aroma. For those of you that dislike eating whole fish it works just well with fillets (you'll need less time in the oven) but a barramundi is a fairly good fish to eat whole as the middle bone separates easily. But if you are looking for a really simple 30 minute dinner, and that's a genuine 30 minutes (actually more 25 minutes), please give this recipe a try! So tell me Dear Reader, do you eat fish very often? 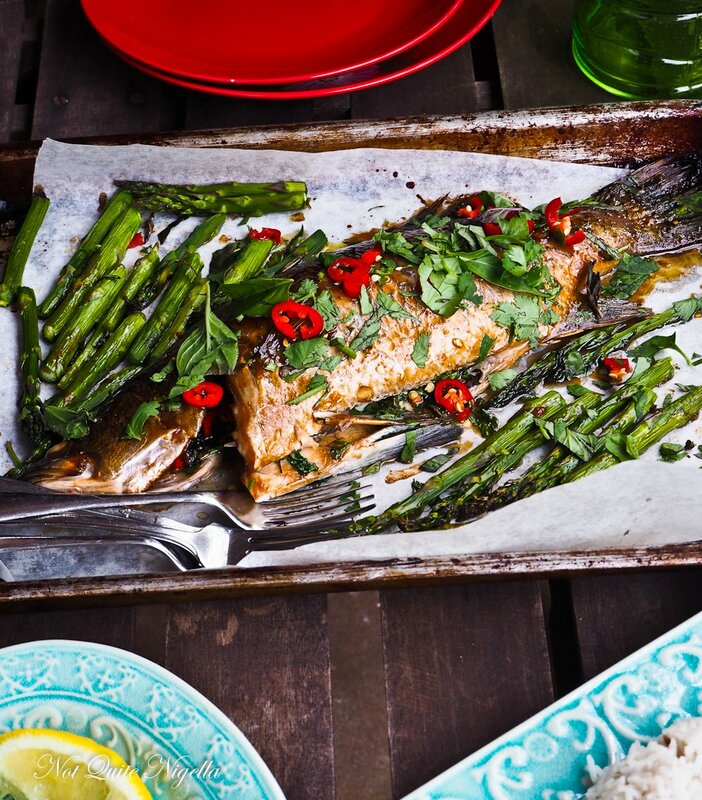 Do you like eating whole fish or do you prefer fillets? We ate this with rice, what would you pair this with? Step 1 - Preheat oven to 200C/400F. Line a baking tray with parchment. Roughly chop the herbs and slice the chillies - dice them finely if they're the small, hot chillies as you don't people getting a large piece of hot chilli. Fill the cavity with the herbs and chilli leaving a little to sprinkle on top at the end. Step 2 - Mix the oyster sauce, sweet chilli sauce, oil and fish sauce. Brush this on both sides of the fish generously. Break the woody ends off the asparagus by breaking them near the base - they will naturally snap at the right spot. Place next to the fish and drizzle with a bit of oil. Bake everything for 15 minutes. You can make rice or salad if you want while it is baking. Step 3 - With 5 minutes to go, brush the fish with some more of the sauce and now brush the asparagus with some sauce too. Bake for an additional 5 minutes.